This royal thrown was used at the 2010 Engage! Conference and I spotted it on the world’s best wedding blog, Style Me Pretty. Immediately I began searching the internet for a place to purchase and/or rent this chair. While I couldn’t find the exact one in the photo, I found a few fancy options for guests fannies. 1. From Floral Art LA (this site is to die for), I give you, in all its glitter goodness, the sequin chair!!!! Inside the clear, Lucite frame lies spectacular silver sequins. 2. This chair will be mine, oh yes, one day it will be mine. Floral Art LA has just about any floral chair, like this fuchsia peony floret. I mean doesn’t this just take garden parties to a whole new level? 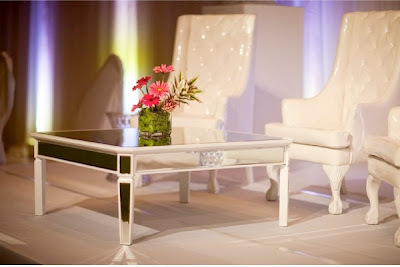 The back and arms are made from Lucite – the clear, plastic looking material that’s all the rage in rental chairs! Wouldn’t this be PERFECT for a totally girly birthday dinner, bachelorette party or shower? If sequin chairs aren’t in your budget (certainly not mine!! ), then there are sequin chair covers out there. The one pictured above is from Wildflower Linen. And speaking of Wildflower Linens. Please look at their gorg chair cover designs!!!! I mean the ruffles, rosettes and sparkle! I could have included almost every chair from their site! They Call Me King Hov, copy?